You've got questions, we've got answers. Tarot readings are renowned for divining the future via the spread of cards and the wisdom, psychic ability and insight of the reader. These packs of 78 cards feature wands, cups, swords and pentacles in the 56 minor Arcana set, and images, such as the Hanged Man, the Fool and the Devil within the major Arcana cards. Every week our tarot card drawer draws three cards with personal message. Choose your own spiritual card. Please follow the weekly card draw on Facebook. 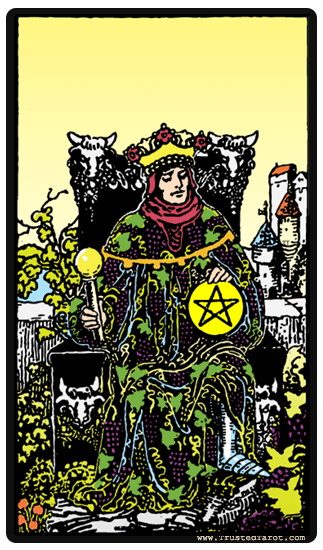 The King of Pentacles embodies the mature and dependable aspects of maturity. Anyone represented by this card is tied to success and status. While it may refer to your own characteristics, the Kings most often stand in for other people in your life who can aid you. You can expect this person to value prudence of intelligence, and, if it represents an event, it may be a financial windfall or promotion. The cautious progress you have been making is leading you towards success. The advice you recently received will be helpful in achieving your goals. The idealism you have shown has made you confident and reliable, but it may do better to begin focusing on your financial security for a period. Consulting a professional or elder will help protect your efforts. You have intrinsic abilities in the fields of financial profit and material gain, even if you are not aware of them. The money you earn through your own efforts will bring rewards beyond material gain. The King of Pentacles is a reliable, confident, self-sufficient individual. He shows signs of success, wealth, and endless personal growth. Attaining your goals will likely require some self-exploration as well as a firm commitment on your part, but the outcome looks positive. Your answer is yes. Get an empowering psychic reading. Register today & receive a 50% introduction discount. Like crossed blades, the II of Swords represents a balance of forces. Not necessarily an absence of struggle, but an equal distribution of force in opposition. It may indicate you are in a position to mediate a conflict, or it may instead suggest you are caught in the middle of a dilemma with no clear outcome. The resolution of this state will likely bring peace for you. Being honest about your past will help you to make a difficult choice. The conflict that you have been experiencing will be resolved by a new approach. There is a conflict that will lock up your energies in the effort to resolve it. By overcoming indecision, you will take deliberate action to decide the resolution. The difficult situations that lay ahead of you must be overcome immediately, so do not delay or hesitate. Bring about the best possible ending by acting honestly and with honourable intentions. 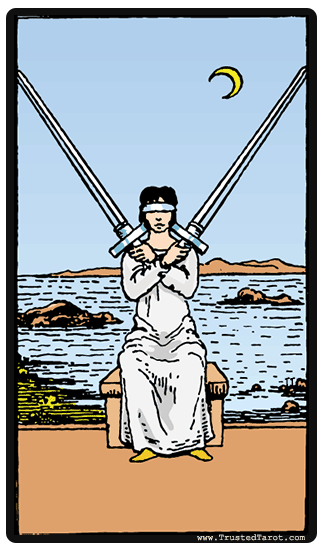 The Two of Swords symbolizes conflict resolution and decisions that must be made. However, the conclusions are likely through seeking inner peace and coming to a compromise. While this card suggests a general peace of mine, it leans neither toward yes or no. Thus maybe is the answer. You almost certainly have great reserves of courage, and the perseverance to see yourself through difficult times. You may not be aware you possess these qualities, but you will find yourself needing them soon. Expect conflicts, possibly small, but more likely significant. It is not certain where they will arise, but there is no doubt you possess the ability to overcome your adversaries. Despite slow progress, your determination and sustained efforts will lead you steadily forward. Do not give up. There is a great conflict approaching, but do not fear. Through courage, you will overcome this hurdle and experience a major change in your life as a result. Continue to believe in yourself. The odds may be against you but you have the power to beat them. The courage to fight on and accept challenges will lead you to a bright future. 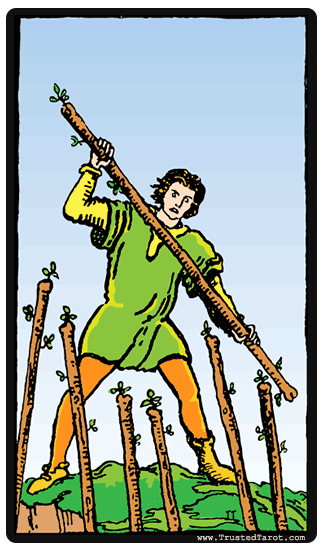 The Seven of Wands represents long-term success due to the strength it takes to overcome obstacles and being able to take on calculated risks. Using courage to stand up for yourself and what is best is what this card is all about. The answer you are seeking is yes. Please follow the weekly card draw on Facebook. Tarot Readings rely upon the cards for indications. This ancient wisdom is another key to your soul, allowing you to become more self aware and understand your reasons for behaving in the ways you do. You will start to realize the deeper purpose to your life, it's often hidden to most people as they aren't prepared to dig deep within themselves and take the step forward into understanding. As your online Tarot Reading progresses you will see the way the Tarot Cards fall into a spread becomes more relevant to your situation. Your professional Tarot Reader has developed skills in clairvoyancy over many years of practicing Tarot and when this is combined with your energies, the Tarot deck will attune to you and your life situation. You should not expect your Tarot Reading to provide direct answers to the questions you need answered. It is a way for you to divine your path in life after examining all the options available, using your own insight and wisdom while being guided by the way the Tarot Cards fall into spreads. The difference between expert Tarot Readers and novice readers is the understanding and awareness applied by the Reader to the spread of cards and depth of meaning extracted from spreads. It's easy to gain superficial understanding and insight from a spread, answering some problems in a basic fashion. Skilled and knowledgeable psychicworld.com Tarot Readers have acquired deeper levels of meaning and information from the cards. The deck of Tarot Cards and Tarot Readings are an ancient form of wisdom, which may have originated in Egypt or the Far East in either India or China. The philosophies of the ancient worlds have helped mankind for centuries and Tarot Readings are no exception. When you opt for an online Tarot Reading from psychicworld.com, you are choosing readings from experts who have spent many years honing their skills in Tarot. Finding a Tarot Reader in your community may be more difficult, particularly if you are looking for the best readers with the most knowledge of the ancient art. Arranging an online Tarot Reading allows you to select from a number of different readers, to find the expert reader most suited to your needs. Before your reading, you should relax and quietly contemplate the questions you want answering. Your Tarot Reading can be directed to find the answers to queries about relationships, career and money, finances, love and lifestyle. In fact, any problems in life that need thinking through with care can be addressed by your Tarot Reader and your influence and energies will be used to predict and divine what could be the best answers for you. Achieving spiritual awareness and knowledge is a difficult target for anybody, particularly when life's pressures can cause so much stress. The very task of living and surviving takes over for many people, they don't dig into their inner psyche to discover the wealth of inner peace that can be achieved. You can develop your true inner self, with the assistance of Tarot Reading and other forms of ancient philosophy available from psychicworld.com. When you take time to develop your personal inner wisdom, you will reflect greater self confidence and awareness, attracting other people to your aura and being. Don't struggle with problems or jump from one crisis to another, when skilled Tarot Readers can assist you in achieving the life balance you need, and making the right decisions in life to ensure you keep moving forward and growing. "I have never had a better, more accurate, more specific and honest and helpful reading in my life. I tried free psychic chat and my psychic read my situation right away, so I continued with a live psychic chat session"